I'm not well, where do I go? I’m not well, where do I go? Plan your hospital visit, leave yourself plenty of time to get to hospital, however you travel there. Don't be afraid to ask questions about your care; doctors and nurses are happy to explain things. 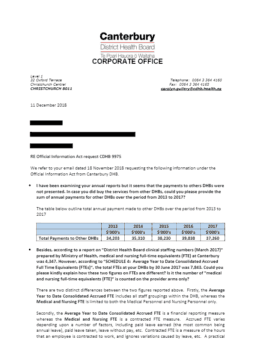 Information about payments to other DHBs over the period from 2013 to 2017 and information about clinical staffing numbers. Showing 1-1 of 1 results, page 1 of 1. Note: The Send button will display once you've entered some information. Call or text 1737 to speak with a trained counsellor. This service is free of charge and is available day and night. FACE: Face drooping on one side? ARM: Is one arm weak? SPEECH: Speech jumbled or slurred? TAKE ACTION: Call 111 immediately. There are many benefits to you signing up with a General practice team, and you’ll immediately have a team of people to help you stay well. Coming into hospital can be a little bit scary for kids! To help parents and kids, the guys from What Now have made some videos about being in hospital. Join us on our social media channels. In an emergency call 111 and ask for an ambulance.